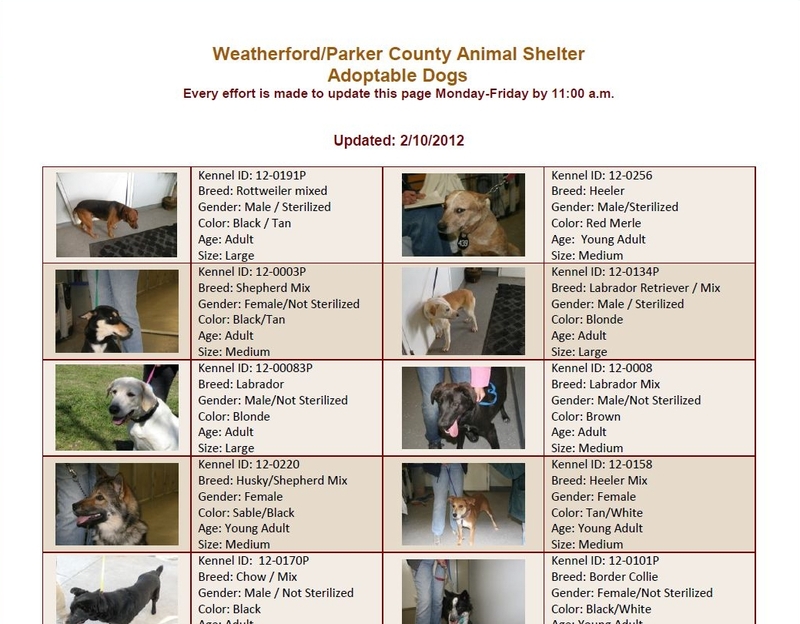 Your Weatherford/Parker County Animal “Shelter” – Apathy or Incompetence ? UPDATE March 21, 2012 – The webpage to which I referred yesterday, March 20th has been taken down and is no longer visible – no doubt a coincidence! No need to trouble “shelter” management with pesky things like facts! After all, out of site out of mind – right? What the public can’t see, the public won’t question – right? Folks, don’t be fooled and don’t be quite! That’s YOUR shelter and the city and county “officials” work for YOU! As long as they are spending YOUR taxes and drawing a paycheck paid for by YOU the taxpayer, they are answerable to YOU. Election day is REPORT CARD day. Animal shelter management and employees are ultimately accountable to an elected official. You may not be able to directly influence change at the shelter, but you can fire city council members with your vote. And I believe that is the appropriate place to start. Would you allow these “officials” to mismanage your business the way they are running the Animal Shelter? How long would you tolerate their apathy and incompetence if you were paying all the bills directly out of your bank account and all the animals belonged to you? Folks, we see here an example of how efficiently your “shelter” is being managed. However, we also see on the same page that the last updated was February 10, 2011. The image below was taken from the Animal Shelter’s website today, March 20, 2012. That’s 39 days since the website was updated. Question: How many days are animals held at the “shelter” before they are executed? I wonder how many of the helpless animals shown below are still alive. Do you think their chances of survival would be enhanced if the public had some way of knowing that they are being held at the shelter? I don’t know about you, but I am one taxpayer who is disgusted with the manner in which my hard-earned money is being spent by the Animal Shelter. Just remember Mr. Mayor we vote. Oh, they see the problem(s). They are merely denying that they exist. I am sure that most of these dogs are long gone. I am also disgusted to learn that it is shelter policy to hold strays for 3 days for owner to reclaim them, however citizens are beginning to speak out publicly at city council meetings and on public websites like Pawsitively Texas on Facebook, that often they are killed the SAME day they are brought in by an Animal Control officer (ACO). One account of the the ACO actually laughing at a woman who cried over her two cats being killed by them prior to the stray hold being up. The reason for killing early you ask…..POOP. The cat pooped in the cage on the drive in. A scared cat POOPED and this justified killing due to possible “health risk” to other animals. Folks, this means, basically if your lost dog is not carrying his shot records in a knapsack on his back when he is picked up the aco, they can immediately kill your lost pet due to being a “health risk” to other animals at the shelter. Now how insane is that???? And since I last wrote here, ALL volunteers have been suspended at this shelter until further notice. ALL. Free help being turned away, Why??? Is this shelter hiding more mass killings of healthy adoptable animals???? Why are volunteers not allowed to help? Maybe it’s time we look to other shelters for ideas on how we can make improvements at this shelter. And I propose it begins with leadership. We need a new shelter director whose goals is to reduce killing and see more animals get out alive or back to their rightful owners!!! Check out this link of what this shelter did to raise owner reclaimed pets by 60%!!! It’s time for shelter reform folks! This is an embarrassment to our city and county. The Weatherford Animal Shelter is a disgrace. I am taking note of the politicians that are not doing the right thing for the animals and come election day they will not have my vote.Get a leader in that shelter that is pro no kill. Stop lying to the public and stop killing the animals. Thank you parker county blog for bringing this to the publics attention! How many people are missing dogs and look online to see if they are there and then believe they aren’t there because of the page not being updates?? C’mon weatherford! Start holding your public officials accountable for what your tax dollars are being spent on! The shelter is now using adoptapet.com to list adoptable dogs ONLY. That is of no help to people looking for their recently lost dog. Strays are (supposedly) kept for 3 days before being made available for adoption, pending medical and temperament evaluation. After that who knows how long it will take to get a photo onto the website, if the animal is not euthanized for a variety of reasons, real or “perceived.” And for that matter, the quality of those photos might make recognition of one’s own pet rather difficult. It looks like Apathy and Incompetance. Thrown in a little fear of the citizens by making sure they are not held to a status of transparency, like most elected officials. Oh, and a policy of misinformation so pervasive that it sickens all of us. Well, Parker County and Weatherford citizens if you are really concerned it is time to stop being a part of the status quo, and time to change personnel at the elected official level! Vote, Vote, Vote until the elected officials start doing the biding of the citizens of Parker County and Weatherford. Though I’m “all about our W/PC Shelter, why “Senator-Blutarsky” are you on this blog??? You are NOT even from TEXAS!! Get off and let Texas take care of themselves!! You are welcome to express your opinion on this blog as long as you are respectful to others contributors. People from all over the United States have contributed to this blog, and we encourage them to continue. Therefore, with all due respect, we ask you to please refrain from assuming authority to determine who may or may not contribute to ParkerCountyBlog. Our policy is clearly stated under the pull-down tab “Blogging Policy”. Didn’t you see “National Lampoon’s Animal House?” I knew who Senator Blutarsky was immediately and to those of you who don’t here’s some news – John Belushi’s not around anymore, so he can’t be writing to this blog. Sorry, everyone. I stand “chastized”. I guess I’m just so frustrated with everything that is happening or should happen, at the shelter and with those in charge, I just reacted to another “voted upon” person. I specifically asked how animals are selected to be euthanized and if there is a policy or procedure in place. ms. tawater made it very clear they just figure it out day by day and do not follow any operating manual or any policy or procedure. she is an employee at the shelter who said this on record her at the animal advisory committee meeting on March 8. http://weatherford.granicus.com/MediaPlayer.php?view_id=2&clip_id=362 How can you expect anything to improve if these staff members can do whatever they want however they want and NOT be accountable for following procedures? You nailed the core issue – no procedure and no policy, along with no accountability. We have 80IQ people ” just doing their job” – in most aspects of government positions at the city and county level. not only locally but Nationally. So Wake up Parker County….. The elephant in the room that everyone is missing is voter apathy. If people would become involved in their local governments and get out an vote on election day they might find their tax dollars being handled more efficiently. The problem is folks do not care period! They are to lazy to crawl out of their caves and go down to the ballot box on election day and pull the lever. This is the same reason we can never get quality candidates to run for public office at any level and we keep getting the crooks and those on the payroll of special interest groups elected into office. When the pain gets greater than the pleasure I suppose things will be different..but for now we haven’t reached that pain threshhold yet it seems. Cindy – I agree in the spirit of what you said……..but………”voting the wascals out” has proven to be a preplanned road to failure every time. Honestly, how many elected PUBLIC SERVANTS have you told, eyeball to eyeball, that you will “vote against them”?…………..they laugh politely and walk away. The embarrassing somnabulism, inaction, and indifference from Bates to Fowler needs to be adressed in more ways than wringing hands and promosing to vote differently. really? How hard would it be to convert to a legit “no kill shelter” ? BTW, Fowler has no responsibility for the shelter! The county commissioners are the people to confront. Again, Blutarsky, get off this blog. You know nothing of what you speak. The shelter is named the Weatherford/Parker County animal shelter….however, I am told that all the management and jurisdiction over the shelter is a city venture. The county was “billed” $433,512.00 (this figure emailed to me by Judge Riley) for animal control services/use of the shelter facility. On top of that amount, the county pays ACO’s salaries to cover 900 sq miles for calls regarding animal control. The county ACO’s are suppose to “drop and go” back out on the county streets, but recently in Parker County Today magazine, Karen Kessler a county ACO was photographed walking and socializing dogs at the shelter. She also answered my phone call working behind the desk doing clerical work at the shelter. Why is a county ACO doing CITY work? Is the city going to reimburse the county tax payers for her services at the “city run” shelter? I asked our county treasurer, Judge Riley and all the county commissioners why she is doing city work on county time. No response. So although Sheriff Fowler may not have any jurisdiction, we sure are sending a LOT of money there for animal control. Furthermore, on numerous occasions I have asked for an itemized bill of who and how that number is derived by the city to bill the county. I heard at the Feb County commissioners meeting that 75% is billed because 75% of the animals that come in are from the county. So I asked Judge Riley why his email to me said that 60-65% of the animals that end up at the shelter are from the county. So are we, the county people being overcharged for animal control services by the city of weatherford???? I have not had any email replies as of yet about these record keeping math questions. I would like the county to post all the animal statistics on their website for transparency. Do they do their own record keeping or do they rely on the city staff to do it for them, because the city staff hasn’t a clue and are NOT following any written policy or procedures and have no consequences or accountability. Is this ok with the county tax payers? For our county aco’s to do city paid work? And to let the city “bill” us without showing any proof of how they determine that is a fair amount? I don’t think so! Where is the InterAgency Government Agreement? I know Federal, State and thought all Local Government Agencies were required to have one of these under any joint effort between Government Agencies. If they don’t have such a requirement at Parker County or for that matter Weatherford this is the prime reason they should! where does ” the buck stop”? help me isolate the governmental employees upon whom responsibility , truly falls? As of this moment in time the Director of Shelter Operations is Asst. City Mgr. Sharon Hayes. The Shelter Manager is (still) Diane Daniels. This information came from Ms. Hayes herself on Tuesday. And unless I missed a memo, Ms. Daniel reports to Ms. Hayes who then reports to Mr. Jerry Blaisdell, whom I believe is appointed by the Mayor. That is correct. daniels reports to hayes, who reports to blaisdell, who reports to the city council and the mayor. The trouble is that none of them seem to give a damn about anything but keeping their jobs and covering each others butts with lies and stall tactics. The real cancer lies at the very bottom of that food chain. Everything above is nothing but BULLS**T! Way to go Harry, that should get people to the polls! Please, folks share what you know as facts, but the personal attacks attract no one. The key again is that no one is going to file a lawsuit to try and compel these elected officials, no one is going to try to conduct a recall, so the only solution is to inform the public on every venue we can. Several Parker County Magazines have addressed the issues, The Democrat has addressed the issues, Facebook is addressing the issues, citizens of Parker County are proactively engaging our elected officials that have some responsibilities in these matters. If these elected officials don’t listen and respond then the elections are the only recourse. Get people out their, to vote!!! Then if the new people don’t respond appropriately recall or wait to the next election. It’s not complicated. Voter appathy as others have said is the real issue and change will not occur until the Parker County Voter do their civic duty and step up and vote. Not just a few all of you! Harry and Senator this forum is not a personal attack on you and your ideas, however civil discourse is a factor on any Blog you venture too. The moderator can and should moderate that to keep the personal attacks to a minimum, I hope you will share but try to self-moderate the indignant outrage aimed at individual contibutors, thanks. Facts are the only things that matter in making decisions. I have seen and experienced the undeserved treatment that volunteers have suffered at the hands of weatherford’s “distinguished” politicos. A few volunteers helped at the shelter for a few very uneasy weeks in February and were then told that there services were not necessary for a month while the city restructured the volunteer program. Just LAST WEEK at a meeting for potential and former volunteers, it became quite clear that in the three weeks that had elapsed little or nothing had been accomplished in the way of restructuring the program. It is quite clear to someone who has been there that the city wants to hand pick the shelter volunteers, just the same way they chose individuals to serve on the Animal Shelter Advisory Board. As I said, I’ve been there. I’ve seen it. I heard it (and can still smell it). I’ve been in the trenches. So my anger has been chosen – it’s been earned. If my posts have offended anyone, that is anyone who is not drawing a city/county paycheck, than I sincerely apologize. I shall try to restrain my demons in the future. Understand Harry, it is very frustrating for us all, that live in this beautiful community. I am a fifth generation Parker County Resident, and few issues are responded to quite as forcefully as this issue. But, this is symtomatic of the problems of this country today. Our very moral fiber is being pressed to the maximum by elected officials that are not doing their sworn duty of representing the electorate that put them in office, and being caretakers of the constitutional requirements of the office. Somewhere it seems that the politicians are now defining themselves and I rather than we the people. The winners of a well run, sympathetic shelter are the people of Parker County. This takes an incredible amount of time and effort of both shelter personnel and volunteers. When there is cooperation of all parties, we all win. Right now no one wins and the animals suffer. For years the volunteers looked away for the benefit of the animals. How much abuse, bullying, and hostile work environment should a volunteer “take” before they leave and go fight for what is right? We found the animals were going to suffer whether we stayed and looked the other way, stayed and tried to make change, or left. The volunteers voices are finally being heard loud and clear. There is a big problem here. People are angry and frustrated. And the people want answers and want changes, lasting changes. I think this city needs to take a closer look at paid employees and see where they went wrong. Fix that first, then you may have volunteers return. There are written policies in place now that are NOT being followed. Until you hold paid staff accountable you certainly can not expect good citizens to keep giving of their time and money. Can you? Animals were killed for no good reason on Dec. 20, 2012. When you have someone who can spitefully kill so show “whose boss”, there is no longer a reason for volunteers to stay. Their services can be and are now being appreciated by shelters outside of Parker County. How sad is that? Volunteers that WANT to help, that want to see positive change are not being heard, but rather are being blamed. The new volunteer program being set up now, infact being discussed today at 2 pm, is the only thing I see being addressed. Why? Why are the employees not being addressed? Why are they not following their written policies and procedures? To have cooperation of all parties you must first fix the issues with the PAID staff. Period. I clean my house before I invite guests over. They need to do the same, instead there are no mirrors, just smoke screens.